Since the advent of SuccessFactors Employee Central suite, one of the critical requirement is to display remuneration / pay statement within the SuccessFactors employee central integrated with on premise SAP payroll system. While this information is currently scattered in various implementation guides, The hunt for single source or an article which gives sequence of technical steps required to achieve this integration is still on. This blog aims to address this gap by illustrating the said integration. Please note that these steps assume the pay statement is already configured in SAP. Each of the above steps are illustrated below . STEP 1. Implement SAML configuration as per SAP note 2253359. SAML, security assertion markup language is an XML based open standard data format for authentication and authorizing the data between parties, in particular between identity provider and service provider. In our case SF EC system is an identity provider and On Premise SAP payroll system is the service provider. Follow the steps given in SAP note 2253359. The manual implementation of this note results in activation pay statement service in SAP. 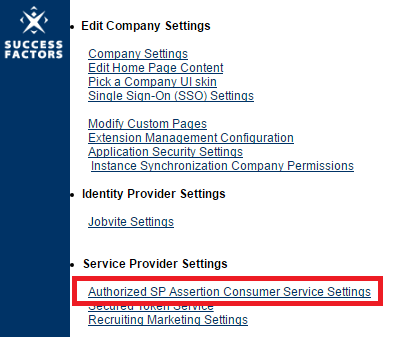 Click Add another Service Provide ACS and add the assertion consumer service and logout URLS. 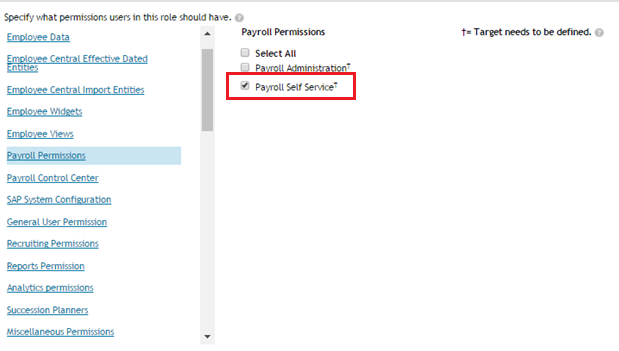 In SuccessFactors Employee Central Admin center , Configure the earning and deduction portlet for the payroll information page in the payroll system configuration object. 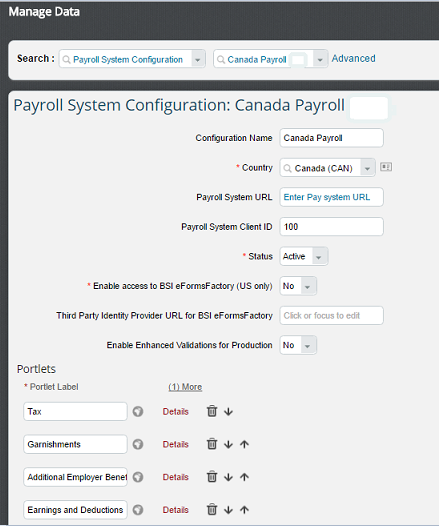 Go to Manage Data , Create New Payroll System Configuration object, if not already exists. Under Portlets, Click on details section of Earnings and Deductions , make sure the service ‘Pay Statement’ is selected from the drop down as shown in the screen below. Tip: SF EC stores the names of services in the Picklist ‘payroll services’ (Configure Object Definitions- Picklist) . Make sure that the external code of pay statement is ‘1’. 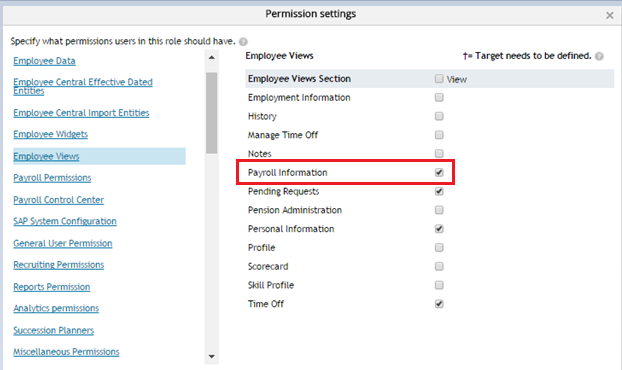 Following screen shots are self explanatory to setup the role based permissions in SuccessFactors Employee Central. 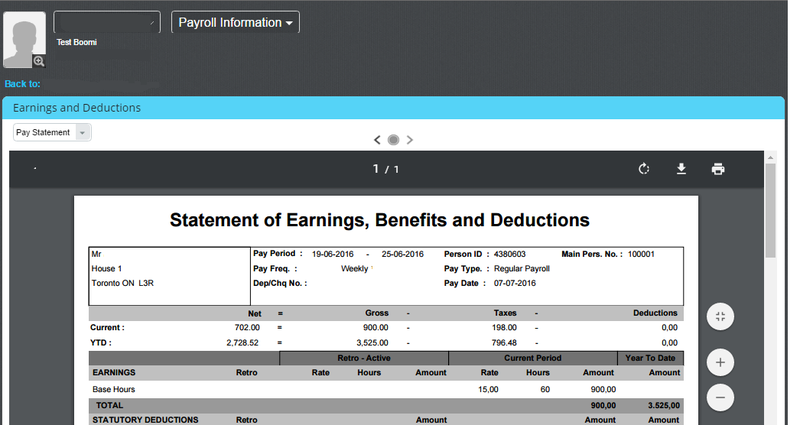 Display pay statement in Employee Central ( Employee File – navigate to Payroll Information). Latest pay statement will be shown. Options are available to navigate to pay statement from previous periods, Print or download the pay statement. We hope this helps and expedite your work towards to invoke this wonderful functionality. Feel free to provide feedback / improvement and share your learning’s in the comments section. Jai Karan Korpal is an experienced SAP and SuccessFactors Integration Architect, who specializes in Integration, Employee Central,Employee Self Service. Gobinder Sandhu is an experienced SAP consultant and project manager with expertise in SAP HCM/Payroll , SuccessFactors Employee Central , EC Payroll , SF Recruiting and on-premise – cloud integrations . Great insight ! Looks like this will work for customers who keep SAP ERP and Employee Central at the sametime. If a customer is moving to EC for HR and ECPY for payroll and sun setting On premise SAP (including ESS/MSS service), will this still work ? These steps are relevant for EC payroll implementations as well. Also, In case on-premise SAP payroll system is being sunset, The HR Forms pay statement can still be transferred and leveraged in EC payroll. Rest of the steps are same as explained in the article. most customer user webdispatchers in the landscape hence the query is do we use saml2 authentication from gateway or ERP. I think it should be gateway however wanted to check your experience. Thanks very much for this insightful article – we are in the process of planning our SAP SuccessFactors employee central module implementation at present and this is an element that we have had a lot of debate on. We have some concern over security/confidentiality with pay statement viewing due to shared workstation instances. Do you perhaps know whether it is possible at all to have the specific tile for viewing of the pay-statement information to bypass SSO and force the User to insert his login credentials again? Hi Russell, yes it can be done that way as well. This should force the service to ask for credentials again as soon as user clicks on the Pay Statement service. See the screenshots below. Does mash-up require the SAP system to be on a certain EHP (6/7) version? The blog was written during our implementations in ECC EHP 8 . We have implemented earlier the payslip view online using same service as early as as EHP 6 SP 23. That was in HR renewal feature pack 01. We also went live with Fiori app for pay statement leveraging the same service. 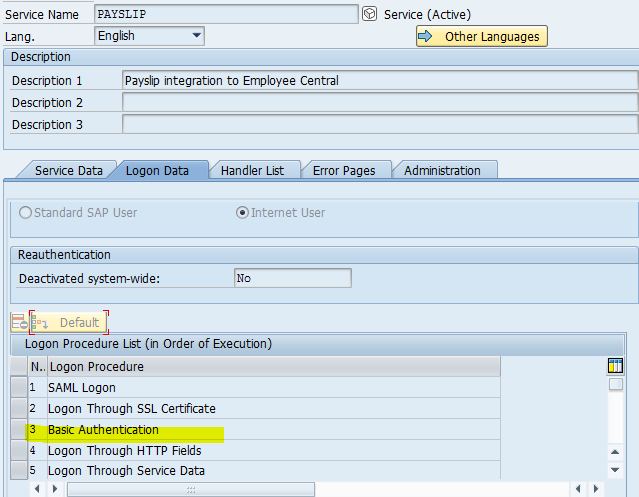 Crux of the story , since payslip service is available in SAP ECC EHP 6 , mashup will be possible as well. I have no doubt for EHP7/8. Hi Jai and Gobinder, Is it possible to use this solution having ECC 6.0 without EHP installed? I am working in a Employee Central implementation and the client wants the payslip available in EC. A lot of thanks for your answer. which application do you want to use? you can configure it as an navigational url. the challenge will be sso between EC and your ECC system if you do so. We have not activated EC payroll in our instance and I cannot see the “Payroll System Configuration object” in Manage Data. Can you please let me know if activating EC Payroll is a mandatory step to implement payslip mashup. You will have to activate “Enable Payroll Integration (Valid for SAP Payroll in ERP Systems)” in Company settings in Prov. if i want integrate with SAP ERP HCM payroll already exists what the process or any content should i go? Thanks, I was able to progress after enabling payroll Integration in provisioning. Now I have completed all the configuration for Password based login (Same user id in ECC and SF EC), but I am getting the error below in the Pay Statement screen. Can you please suggest what could be wrong. We’re having trouble processing this request due to a problem in the system. Please contact your Admin. Does the PAYSLIP service access HRFORMS based on the country grouping? My requirement is to show one payslip for all countries. I believe if HRFORMS is being used, then we would need one form per country grouping effectively copies to cater to this requirement. Please provide your valuable inputs. This actually is the same as the SAP ESS Salary Statement configuration where there are 3 HR Features to control which form (PE51/HRFORMS), report variant (for PC00_Mxx_CEDT), and smartform/PDF conversion program (for using PE51 form, which will have to convert to smartforms then PDF, then display in SF EC). Any suggestions for what I might have missed? I will think this may be authorization setup issue on SAP ERP. Normally, this employee can view their own payslip (ie. ESS scenario), as well as HR may view employees’ payslips (ie. MSS scenario). You may have to check the authorization setup on the user logging in SF, then it should be the same in SAP ERP. I have also tried to copy the URL and paste to a new browser session. If SSO is configured, this new browser session will use the existing SF login account for the authentication; If you paste to a private session (or another browser), it will redirect you to SF login page. It is needed to pay a user license (employee) in EC and to have a named user license for the same employee in EC Payroll (Payroll On-premise)? This has stopped the customer for considering this solution, what it seems to him a double license cost. Article is really self explanatory in a nutshell. Can you please let me know is there any possibility to display company logo as well in the pay statement? This involves the pay statement form (PE51 or HRFORMS in SAP) development. Sure it can have company logo. I have the following error while accessing the Paystatement or W4 URL in EC. I have verified the SAML configuration, SICF services, User Id and Roles in EC and SAP. The webpage at https://my010XXXX.payroll.ondemand.com/sap/ec/payslip/get_payslip_by_offset?sap-client=100&PERNR_EC=XXXXX%2CXXXX%2CXXXX&sap-language=en&OFFSET= might be temporarily down or it may have moved permanently to a new web address. Please check following notes and particularly #6 as your on premise system should be accessible through internet. Unfortunately, Authors of this post did not highlight pre-requisites which are most important as most of the other config in On-premise and SFs are very much straight forward and documented in SAP documents. In this scenario you can think of using SAP Web Dispatcher and try to keep in DMZ so that you can avoid questions from your IT Security team. I’m trying to set up the payment statement, but upon reaching the stage of configuring the PAYSLIP service in SAP transaction ‘SICF’, I can not find the node. Do I have to install some service or business function? if so, which one? Hi!, we have already enabled this solution, through the web we can see the pay statement, but with the mobile application this has not been possible, do you know if this should work on the app also? Any Idea why this would work from within our Internal Network but not from outside? We realise that SF is a cloud-based solution so can’t understand why the interface doesn’t work for users outside of our network. I am replying too late. hope, you would have already found the solution . You might have configured Local URL for Payslip. e.g. prd.sap.com is local URL which might have not exposed to the outside world (Internet). You should coordinate with Networking team to get the Public URL to expose the SAP services to the internet. Networking team will do so by setting up the reverse proxy.